From the tartan mill to your doorstep, our 8 yard kilts are 100% Scottish made with love and passion. The process starts in the north of Scotland at our tartan mill in Keith where 100% pure wool yarn is died and woven into the finest 13oz tartan in the world. It then moves to Perth where the tartan is measured, checked for imperfections, cut and marked ready for our kilt makers to work their magic. Next it’s off to Paisley where our makers with over 100 years of experience between them hand stitch your kilt the traditional way. Finally it’s back to Perth for a final inspection before being shipped to you anywhere in the world. We use your full height to double check the kilt measurements you give us. 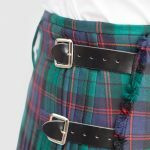 Most of our kilt makers have been making kilts for decades so can quickly tell if a set of measurements your provide looks wrong based on the persons height. From the top of the hip bone to the top of the knee. This is not the final length of the kilt. House of Edgar is a family business that have been making beautiful product for over 200 years. They now specialise in milling tweeds and tartans, which are turned into gorgeous products like kilts, jackets and throws. Their tartan is weaved the traditional way in the north of Scotland. It then travels to Perth, where it is measured, cut and prepared for sewing. Then it's off the a team of kilt makers in Paisley, Glasgow, before being shipped to your doorstep. Their jackets are made in small runs with most sizes held in stock. This means we can get beautiful handmade jackets out to you within days. Throws and blankets are also help in stock and available on express delivery. I’m proud to have an amacing sporran from the Artisans of Scottland. I will celebrate your work every time and at all events in the swiss piping scene. Their help and communication during the building process was perfect. This is one purchase that I made that far exceeded what I ever expected to receive. Superb range of possibilities and brilliant production by Scottish artisans. Highly recommended on every front. Our heart is to preserve Scottish artisanal skills. All our products are handmade the traditional way in Scotland. By buying from us you help strengthen traditional businesses and enable them to continue to pass on their knowledge to the next generation. We represent the artisans directly, ensuring they get the best return from your purchase. We also give 10% of our profits back to the makers as a thank you from us and our customers. If we're successful it's down to there skill and craftsmanship so it's only fair. We exist to celebrate Scotland and her makers so we only stock Scottish products. We believe that designed or handmade in Scotland is something to treasure and shows that quality and craftsmanship matter. From the tartan mill to your doorstep, our 8 yard kilts are 100% Scottish made with love and passion. The process starts in the north of Scotland at our tartan mill in Keith. 100% pure wool yarn is died and woven into the finest 13oz tartan in the world. It then moves to Perth where the tartan is measured, checked for imperfections, cut and marked ready for our kilt makers to work their magic. Next it’s off to Paisley where our makers, with over 100 years of experience between them, hand stitch your kilt the traditional way. Finally it’s back to Perth for a final inspection before being shipped to you anywhere in the world. 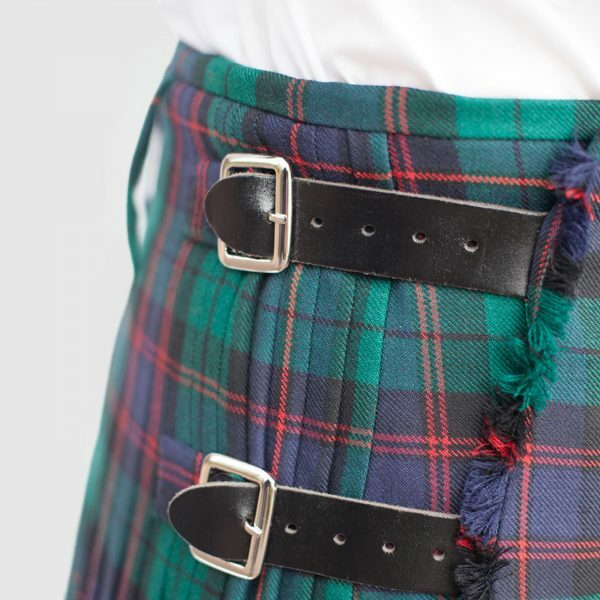 While kilts can be made from more or less material, 8 yards is the traditional length. The end result, when made with a medium weight tartan (13oz), is perfect for every occasion. 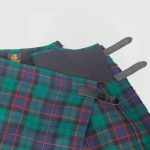 An ideally weighted kilt that hangs perfectly that can be worn all day in comfort. The mill was founded in Dumfriesshire more than 200 years ago, in the fortified tower which still features on the company logo today. It started out with only four looms and a handful of local workers, but due to its significant growth under the management of the Macnaughton family, the business was relocated to Keith in the early 1970s. Once woven, all our fabrics are hand inspected at least twice, with any flaws or missing threads being corrected by our highly skilled team of hand menders. Only once our discerning menders are happy, will we allow the fabric to proceed to finishing. The finishing process allows us to finally “tweek” our fabrics, by dyeing, washing and pressing them to provide the finish specified by our design team. For more information on the history and tradition of kilts head over to wikipedia.